The Remote Device Name is the name that the Media Hub uses when you’re accessing the device remotely. 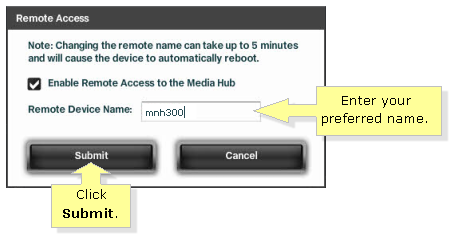 This article will guide you in changing the Remote Device Name for the Media Hub. Access the web-based setup page of the Media Hub. For instructions, click here. NOTE: If you are using a Mac OS to access the Media Hub, click here. 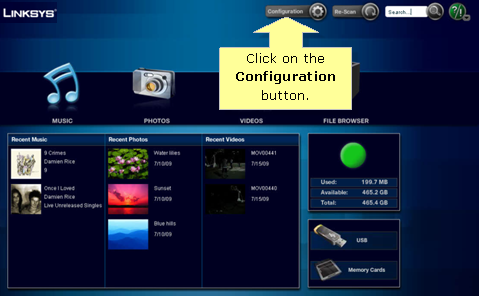 Click on the Configuration button at the top of Media Hub setup page. You will be prompted for a password. Enter your password then click on the Submit button. NOTE: The default password for the Media Hub is “admin”. Click on the Save Password checkbox if you want the page to remember your password the next time you log in. Select the Services tab and click on Configure under the Remote Access category. Enter your preferred name in the Remote Device Name field and click Submit once done. NOTE: Changing the remote device name can take up to 5 minutes and will cause the device to automatically reboot. NOTE: Once the Media Hub has reboot, the web-based setup page of the Media Hub will refresh itself. Your Media Hub’s Remote Device Name should now be changed.